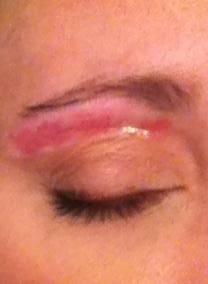 Yes, this is my eyebrow 20 minutes after a wax!!! The cosmetologist said one of my skin care products is making my skin extra sensitive and thus reacting to the hot wax. (As a note I went to a trusted spa, not a cheap nail service place) Lovely. I have put on aloe vera and antibiotic ontiment, and am praying for no scarring. Has this every happened to you?? The next morning...still red and now swollen! I will be wearing sunglasses all day to wide this!!! Well I went to the dermatologists; and apparently, one of my face creams has “retinoids” in it, so I shouldn’t have used wax…who knew!?! I am supposed to stop using the cream for seven days prior to waxing!! I had no idea. She gave me a RX for Bionect (which is very expensive, like $200+!! ), but it will give quicker healing.